The boiling point has arrived in the eons long battle between rival Quasing factions the Prophus and the Genjix. Following a change in leadership, the Genjix are now led by a merciless monster who will stop at nothing to wipe out his adversaries. With their backs up against the wall, can the Prophus handle this new found ruthless aggression from their enemies or will the Genjix finally succeed in their quest for ultimate power? 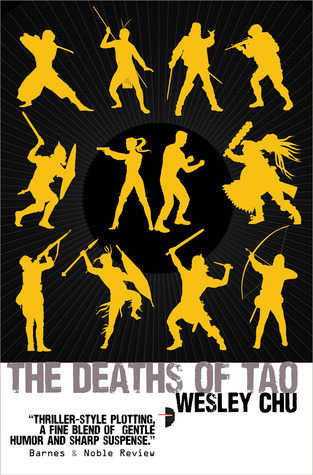 Wes Chu’s The Deaths of Tao is his own personal Empire Strikes Back. This time around, following a significant change in direction, the Genjix are more focused than ever to wipe out their opponents and solidify their power. Enzo, the new leader, is pushing hard to create an environment in which the Quasing can exist outside of their human vessels. In doing so, the Quasing (sans human) are able to come together unaccompanied and get their groove on so to speak, producing offspring. Not only has Enzo ramped up development on creating the aforementioned environment but he’s also pushing a take-no-prisoners approach in the ongoing war with the Prophus. Despite his shocking methods, you can’t really blame the guy. Enzo has been molded since birth to serve the Genjix faction, therefore his loyalty runs deep and he’ll do anything to advance their standing on the world stage. As far as the hero of the story is concerned, Roen has advanced by leaps and bounds since we last saw him. Long gone is the frozen pizza eating, video game playing schlub from the first novel. He’s been molded into a precise and confident individual, mentored and led by Tao, running his own private missions while living off the grid. Before taking off with Tao, Roen had carved out a pretty comfortable life for himself. He fell in love, got hitched and had a kid, which makes his disappearance all the more intriguing and complex. When he officially returns to the Prophus, he’s not exactly met with open arms and it leads to some great writing from Chu. While I enjoyed the novel immensely, I found that the story lost a little of its charm when it came to Roen and Tao. Don’t get me wrong, I didn’t expect a repeat of Tao training Roen but I found myself missing the comedic strength of Wes Chu’s writing. That’s not to say it isn’t there, Roen and Tao have some great moments, just be aware that the book concentrates heavily on the political battle in Washington and the controversy surrounding Enzo’s rise to power within the Genjix organization. This time around, the storytelling is more dramatic, the action is far more brutal and the stakes are a hell of a lot higher. Without spoiling the ending, Deaths of Tao firmly establishes itself as a bridge between the first and final novel. That’s not to say that there isn’t really an ending, just that Chu leaves you longing for part three. Bring it on! September 23, 2013 in Fiction, Wesley Chu. Rebirths of Tao Cover Reveal!